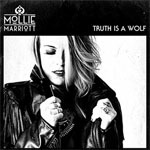 Share the post "Album review: MOLLIE MARRIOTT – Truth Is A Wolf"
In the first hour of his weekly show on Get Ready to ROCK! Radio, David Randall chatted to Mollie Marriott and played tracks from her album. First broadcast Sunday 1 October, 22:00 GMT. Having spent most of her career as an in demand backing vocalist, Mollie Marriott’s debut album ‘Truth Is A Wolf’ is an exercise in finding her own style on a diverse set of songs. Her family ties and CV speaks for itself, but the transition from accompanist to solo artist demands strong songs, a signature vocal style and an album in the old fashioned sense of the word, that will give her a recognizable calling card. She partly achieves all the above with some heartfelt songs that move from the reflective to the self empowering and always aim to emphasize lyrical meaning. The first three tracks alone tell us plenty about her abilities both as a singer and songwriter, albeit the title track is a cover. She opens with the lead single ‘Control’ which is a mission statement for her independence. It initially sounds like the indie rock of Chantel McGregor, but then builds to a big uplifting choral hook which suddenly evokes mid 70’s Jefferson Starship, before a buzz tone guitar break. The song also has the kind of strong bv’s that she herself is known for. It’s short, sharp and immediate with a perfunctory finish and is good choice for a single. It breathlessly segues into the tic-toc snare drum of the relationship song ‘Broken’. Sam Tanner’s nuanced piano line draws us into a layered hook and a vocal collage full of significant ‘ooohs and aaahs’, before a sinewy guitar line is topped by Marriott soaring voice on a big production finish. The funky mid-tempo Gary Nicholson/Bonnie Hayes penned title track also features Paul Weller on guitar. It fits into the current Nashville roots rock template and impresses with an eerie hook and a nuanced stuttering finish. It’s arguably the best track on the album, but pulls Marriott towards an already over populated Nashville driven musical marketplace, meaning it might get lost in the shuffle. The ballad ‘Give Me A Reason’ aims for the same destination, but doesn’t quite convince. It simply needs a more assertive vocal, a fact that the drone like arrangement and choral bv’s can’t disguise. ‘Love Your Bones’ is one of two self penned songs and is arguably the closest to her true style. It’s a song about loss which gradually builds momentum and flows into the hook, complete faux jangling bells and synth, as Mollie’s vocal hovers over the top. The album features 8 collaborations in all, suggesting she’s open to finding the right style and balance. She’s happiest working on a groove such as the excellent ‘Transformer’. As with the following ‘’King Of Hearts’, it’s co-penned with Judie Tzuke and Graham Kearns and is an atmospheric piece that cleverly evokes the unease of struggling relationship and again looks to self empowerment. ‘King Of Hearts’ is a more languid groove with an electro atmospheric feel. It provides the showcase for her eloquent melodic phrasing and perfect diction, and builds unexpectedly to a big wall of sound with a lovely spacey guitar fade. Sequenced as the penultimate song, it reveals her true forte on a smouldering piece with a climatic finish. The powerful arrangement is perfectly suited to her vocal range and might even have been considered as the final track, except she’s got a bigger finish in mind. ‘My Heaven Can Wait’ is co-written by Jim Stapley who also contributes bv’s on the project. It draws on all the core elements that bind the album together, from Marriott’s own soaring vocal to the big wall of sound and choral bv’s, while Ben Curtis’s eerie harp-drone finale is part of several electro brush strokes that give the album its contemporaneity. This entry was posted in ALBUM REVIEWS, ALBUM REVIEWS (Mobile), All Posts, INTERVIEWS, Radio interview and tagged album, Gary Nicholson, Graham Kearns, Humble Pie, interview, Jim Stapley, Judie Tzuke, Mollie Marriott, Paul Weller, review, Sam Tanner, Small Faces, Steve Marriott, Truth Is A Wolf, vocal. Bookmark the permalink.